There’s a good chance you’ve driven by over the years, yet never noticed it. On the way to the store or the doctor’s office. 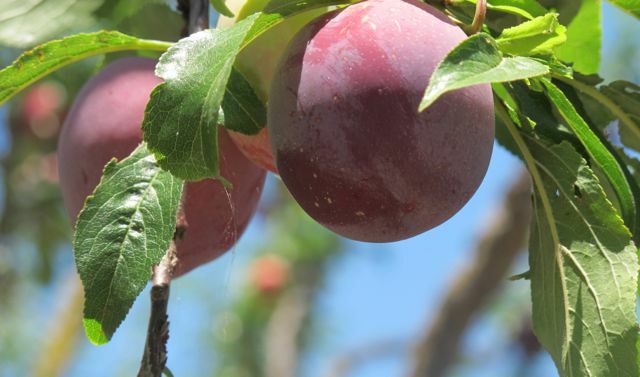 Nestled at the end of a dirt road—between strip malls, townhouses and a medical complex—there’s an unassuming little plum orchard. Right in the heart of Sunnyvale. Row after row of ancient, gnarly trees planted back in 1952, long before the houses, schools and stores arrived. Back when this valley was nothing more than stone-fruit orchards, it was one of many productive patches fueling the area’s economy, before technology became the next great thing. Now the trees are all but forgotten, hanging on for dear life, surrounded by development on all sides. Lucky for us one man is still farming this piece of history—land that’s been in his family since 1881—with love and pride. 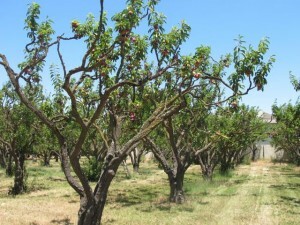 The Santa Rosa plums are ripe and juicy, around the corner in Andy’s orchard. This is what the fuss over local food is all about. 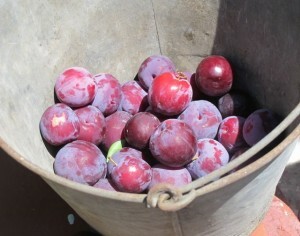 A ripe plum is one of summer’s simple pleasures. You may notice the dusty lavender coating known as bloom, a natural layer of protection for the delicate fruit. No need to wipe it off. Just take a big bite. The rosy-purple skin is tart, almost sharp, while the juicy flesh tastes pleasantly sweet. It’s a great combination. Yin and yang. You may want to lean over the sink as you bite into the ripest fruit—it’ll ooze luscious nectar over everything in its path. Down your cheek. A bare arm. 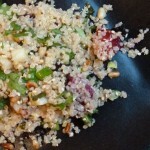 How about slicing one into a leafy green salad or folding into fluffy quinoa? For dessert try an elegant, but surprisingly simple tarte tatin, with bubbling-hot fruit snug under a blanket of buttery puff pastry (from the supermarket freezer section). Developed early in the last century, the once popular Santa Rosa plum is now a hidden treasure found mostly at local farmers’ markets—replaced in large-scale commercial production by firmer, larger varieties that travel better, but sacrifice in taste. One bite of a tangy Santa Rosa will spoil you forever. Eat a plum with iron-rich foods; it can help your body better absorb the iron. Plums are also a source of antioxidant phenols, fiber and immune system-supporting Vitamin C, Vitamin A and bone-building Vitamin K.
Try this easy, yet elegant plum tart. It’s a perfect way to celebrate the first day of summer. Make sure you reserve a slice for yourself. There may not be any left after everyone’s done. Quinoa and plums partner in this light and fruity summer salad. Substitute just about any fresh herbs from the garden or farm bag. Enjoy browsing through our recipe archive by ingredient for other ideas for cooking with this week’s delivery. Toss ripe plum slices with torn arugula and shaved red onion. Dress with a simple balsamic vinaigrette and top with a handful of shelled pistachios and soft goat cheese. The peppery greens and sweet-tart fruit are a terrific combination. Make a loose sangria by combining one bottle of chilled white wine (something light and fruity), one-quarter cup brandy, one-quarter cup simple syrup (equal parts sugar and warm water combined and stirred until sugar dissolves), a large splash of fresh orange juice, two ripe plums (stones removed and fruit cut into small cubes), a handful of ripe berries, three sprigs fresh mint and one sprig fresh basil. Stir all the ingredients well and chill for an hour or so. Before serving stir in one cup of chilled sparkling water. 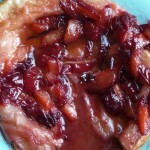 Cut ripe plums into plain (or vanilla) yogurt and drizzle with honey. Add some chopped nuts or granola on top. Slice ripe plums into quarters. Fill each with a spoonful of fresh ricotta (you’ll find at Whole Foods or other specialty stores), drizzle with honey, top with grated orange rind and a bit of chopped mint. Yum. Also great with apricot halves. Cut the zucchini up into cubes, toss with olive oil, just to coat, and roast in a 375 degree oven until tender and caramelized around the edges (about 30 minutes). Serve on toasted baguette, stir into rice or cooked pasta. Toss with drained, canned white beans, minced garlic, cubed tomatoes, torn kalamata olives, olive oil and a splash of balsamic vinegar (plus salt and pepper of course) for an Italian-inspired salad. Grill the corn, butter it well and enjoy. Or squeeze lime juice and add a pinch of hot pepper and salt instead of the butter. Cut any left-overs off the cob and toss into a green salad with cubes of ripe avocado and classic vinaigrette. This entry was posted in Journal by Four Cooking Together. Bookmark the permalink.